Sound from an experimental through-zero FM oscillator, partially built on a breadboard. The planned frequency control circuit isn't connected, so it just has a knob I can turn for different, uncalibrated, tones, plus a modulation input. 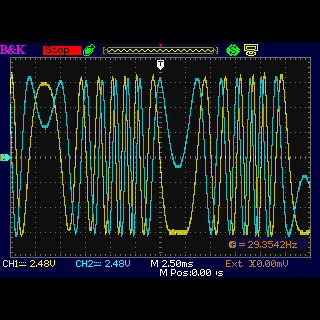 Here I'm feeding some sine waves and noise into the TZFM input, and am passing the output through a distortion amplifier to give it just a little more high end.